Unlike the Republican delegate allocation process, there is far less variation across states on the Democratic side. 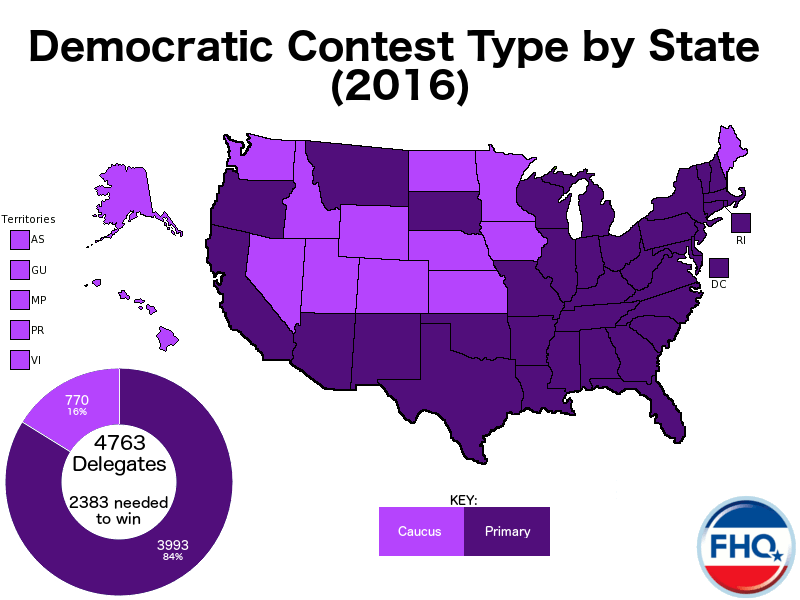 Under the Delegate Selection Rules for the 2016 Democratic National Convention, all states are required to proportionally allocated delegates with a standard qualifying threshold set at 15%. That is not to suggest that there is no state-to-state variation in the Democratic process. Rather, that is a statement of the nature of the differences between the two national parties. The approaches are different. The DNC has traditionally been a but more top-down in requiring a number of mandates that the RNC has not. It is that difference that is the reason for the spectrum of allocation rules in the Republican process. Click state name below for link to state delegate selection plan. 1 PLEO delegates: Under Rule 9B of the Delegate Selection Rules for the 2016 Democratic National Convention, PLEO delegates are defined as pledged party leaders and elected officials. This group is distinct from the so-called superdelegates in that they are pledged to presidential candidates based on the statewide results of the various primaries and caucuses. The Democratic rules pinpoint big city mayors and state legislators/legislative leaders as the types of positions that routinely fill these PLEO slots. 2 Unpledged delegates: As opposed to the PLEO delegates, superdelegates are unpledged party leaders and elected officials, or UPLEOs in the terms of Rule 9A of the Delegate Selection Rules for the 2016 Democratic National Convention. These are members of the DNC, Democratic presidents and vice presidents (current and former), Democratic members of Congress, Democratic governors (current and former), as well as former Democratic members in the congressional leadership and former chairs of the DNC. While this group of delegates is unpledged, that does not mean that they cannot pledge their support to a candidate nor does it mean that such a pledge is binding and/or can not be changed to another candidate. 3 Incremental rounding threshold: The incremental rounding threshold (IRT) is designed as a shorthand measure for the percentage share of the statewide vote a candidate would require to round up to an additional delegate (from among the pool of at-large and PLEO delegates). In some respects, this is an oversimplification of the delegate math (as it could be argued that at-large and PLEO delegates are separate sets of delegates), but provides a rough estimate of what share is required to round up. The largest distinction in this calculation is between states with an even number of statewide delegates and those with an odd number of statewide delegates. In states with an even number of statewide delegates (marked with an asterisk [*]), the candidate with 50% of the vote (plus one vote) would evenly split the statewide delegates with his or her challenger. To round up to an additional delegate, the winning candidate would initially need an increase of 0.5*IRT. Any further stepwise increase in the statewide delegate share would require an increase in the statewide vote share equivalent to the full IRT. This is less complicated in states with an odd number of statewide delegates. In those states, the candidate who has 50% of the vote (plus one vote) automatically receives one more delegate than his or her opponent. An incremental increase in statewide delegate share would, then, necessitate an IRT increase in the statewide vote share. In general, the more delegates at stake statewide, the lower the IRT. This same principle can be applied to district level delegates as well. However, since those district delegate totals tend to be on the small side, the IRT ends up being quite high as it is for smaller states at the statewide level. As a result, rounding up is a less attainable goal, particularly in a closely contested, two candidate race. 4 Odd Districts: From a strategic perspective, another opportunity for campaigns overlooking the primary and caucus landscape ahead on the calendar is the difference between congressional districts with an even number of delegates and those with an odd number of delegates. The latter group offers a small built-in advantage to campaigns in that a win -- even by one vote -- means an additional delegate. In districts apportioned an even number of delegates, a 0.5*(district)IRT increase in district vote share would be needed to break a tie in the delegate allocation from that district. NOTE: Caucus states are italicized above. Both the Incremental Rounding Thresholds and Odd Districts statistics are included in the table, but are less applicable in caucus states -- due to the nature of the process -- than in primary states. Votes at the precinct (or initial step) level caucuses less directly affect delegate allocation than primaries. That is a result of the fact that the precinct level vote determines how many supporters of particular candidates move on to the next subsequent step of the process. Then each step affects the next. Texas is divided into 31 state senate districts rather than the 36 congressional districts the Lone Star state has. The second congressional district in Oregon is split into two subdistricts because of its geographic size. The Beaver state is split into six districts rather than five. Montana, rather than just one district, allocates its district delegates across both an eastern and western district. Though there is just one congressional district in Delaware, Democrats in the First state split the state into four county districts for the purposes of allocating district delegates. Instead of splitting the state into the 12 congressional districts, New Jersey Democrats pair the 40 state legislative districts to create 20 "delegate districts" from which the Garden state district delegates are allocated. Washington, DC Democrats divide the district into two districts combining wards. The district delegates apportioned to DC are allocated based on the results in those two districts as opposed to the district-wide vote in the primary. The remaining one district states -- North Dakota, South Dakota, Vermont and Wyoming -- allocate district delegates based on the statewide vote. However, those delegates are not pooled. The are two calculations, one for the allocation of at-large delegates and another for the district delegates.